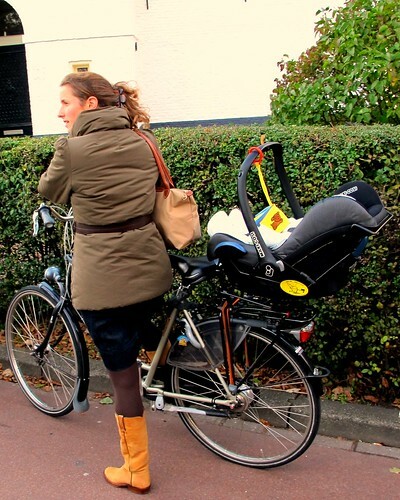 Baby-carrier on A BIKE – Dutch style! MaxiCosi On A Bike- Second one I’ve ever seen! Supermum New Style, originally uploaded by Pays-Bas Cycle Chic. Now, when I saw this by Pay-bas Cycle Chic I thought “Brilliant! Exactly what I would do”… then I stopped and thought “No, actually, not here”. I really would think this to be a great solution in carrying your child when still a baby (i.e. not ready for cycle-child-seat), but in Manchester’s traffic and with our local drivers’ aggressive and selfish attitude???!!! No thanks. If I was to live in the Netherlands (or cycle friendly city/country) then yes. I’m a bit obsessed with children cargo bikes, I think they’re gorgeous! I would like to have one but I know here it’s impossible…how sad. I like cargo bikes, perhaps one day we’ll have one (as we have no car). But I like the idea of being able to simply strap the infant-carrier to a bike, it’d work perfectly say with a Pashely, but I know it’d be suicidal here in this city (unless things change). Well, when I said impossible I meant for now and for my situation. I can buy a cargo bike (in Barcelona they are available in some shops) but that’s not the problem. I have no kids but if I had I would not feel safe to ride them in the city where I live. Drivers are crazy around here. I think things are improving so I hope to feel safer in the future. Now I could use a cargo bike for transporting things but I live in the centre of the town and I have the shops in a 5 five minutes walking…so I have no excuse to buy a cargo bike. Besides, my boyfriend says (and sadly I agree) that we can’t afford such a bike. And finally we have no place for it. The elevator is too small so we would have to rent a parking place or something. Manchester is still very based around the car and car-culture, so I understand when you say you don’t feel safe. But things will change I am sure. I’m with LC, Yuba for example, will deliver their bikes all over. Many companies will deliver a cargo bike to your local bike shop for them to finish off the assembly too. As for carrying a child on the bike in Manchester, I understand why so few feel safe doing so, although I don’t think it would be that bad in practice. I have heard about people leaving baby-carriers on bikes when not with a baby, just because they like the increased courtesy and passing distance drivers have given them when they assume they are carrying a child with them. MrC, do you mean child carrier like the one in the photo?? That would be great if you’d seen it in Manc. I suppose if I try I would see it more clearly. i think cycling with a babies great. but it does make me nervous cycling with a car seat on a bike. but saying that why should you have to give up cycling because you had a baby. I share your worry. But then it also makes me wonder, that it shouldn’t be like this. We shouldn’t be afraid of moving about the city on bikes or on foot, because our roads are full of dangerous drivers. Our local authorities should support and make changes to the existing infrastructure to encourage people (and make them feel safe) to use other types of transport other than the car, this way we’d have less cars on the roads! I’ve heard of people strapping baby carriers into kid-carrying trailers. We’ve taken both of our kids for rides on the back and found drivers to be courteous – amazing how nice some of them can be when they try – but can sympathise with anyone who has a few reservations. I have seen that too. Which I would consider (aka like getting a cargo bike) but what I was impressed about this photograph by “Pay-bas” is of being able to feel safe to strap a baby carrier directly onto a ‘simple’ bike… It is sad and disheartening that our (UK) current roads feel so unsafe that I would not bring myself to carry a baby this way… hence, if and when I’ll have a family, I will look into investing into a proper cargo bike. PS – what I was trying to discuss in this post was the carrying of babies (i.e. less than one year old) on bikes. I will no doubt carry children on the normal child-seats, my dad carried me everywhere like this when I was little. It was the baby age that brings a problem (i.e. when their neck is not strong enough), when they can’t yet use a bike child-seat. I don’t see how that could ever be safe for baby! I know someone who lives in a medium city in the Netherlands and the stories of crashes, near crashes, falls, collisions with other bikes are just legion. Bad enough for an adult with reflexes, but sounds too dangerous for a defenseless baby! I share your worry like Betty (although cars and being in a car can be just as dangerous if not more). But this makes me more convinced that we should make our voices heard by our local authorities, to press them to keep on improving and adapting our existing infrastructure to encourage cyclists and discourage dangerous driving. It is wrong that WE feel scared about cycling with children/babies on bikes because of others, of those who behind a wheel are life-threatening to cyclists and pedestrians. No matter what country we live in.